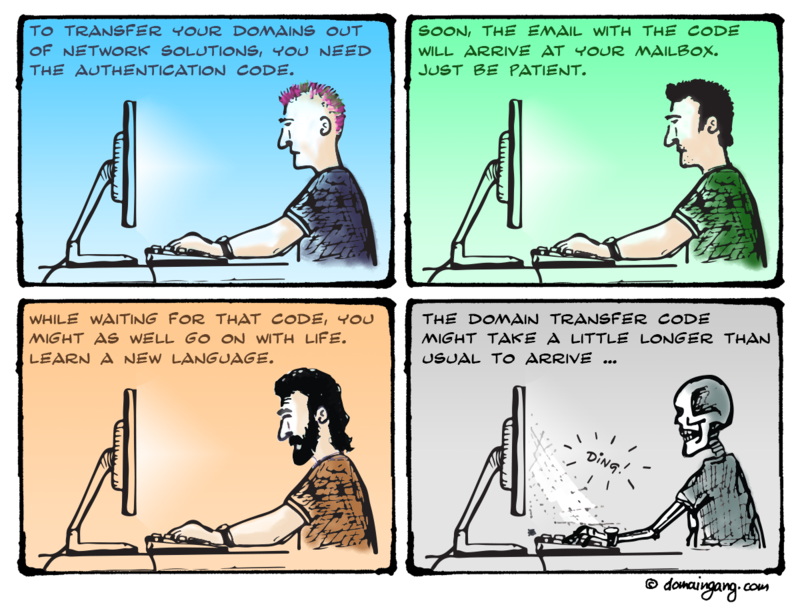 Domainer Comics : Network Solutions getting the job done! :DomainGang Domainer Comics : Network Solutions getting the job done! Domainer Comics is an open series designed to poke fun at facts, figures and other aspects of domain investing. If you missed the previous installments of the DomainGang Domainer Comics, check out “A penny saved is a penny earned“, or head over to the central repository. Faithful to our promise to create a new domain-related comic “whenever” we feel like it, today’s subject is focusing on our friends over at Network Solutions. The original domain registrar has some very odd guidelines with regards to obtaining the authentication code, in order to transfer domains away. Domainer Comics : Network Solutions getting the job done. CLICK TO ENLARGE. The half-life of the average domainer is equal to one NetSol transfer. It’s only funny because I hear complaints about how long they take all the time. Sometimes daily. You would think that with all the complaints they get (and have gotten over the years) that they would beef up that department and provide a solution. But then,. they may already be working on a solution as I type. NetSol is the most secure registrar. Why? Because they never give you the EPP/Auth code!